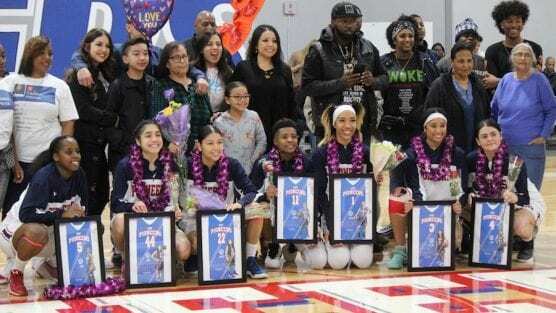 LANCASTER – The University of Antelope Valley Pioneers (22-4; 11-1 Cal Pac) now lead the Cal Pac standings and are in the driver’s seat to enter the Cal Pac Championships with the top seed after handing the Eagles of Embry-Riddle (20-4; 10-2 Cal Pac) a loss Saturday afternoon, 92-88 in intercollegiate California Pacific Conference women’s basketball action inside the Pioneer Event Center. The Pioneers celebrated their seven senior players prior to the start of the contest and would need all of their experience and veteran savvy to get the best of a tough ERAU team Saturday afternoon to pick up their ninth-consecutive win. Both teams were evenly matched throughout much of the competition, with the Pioneers taking the opening period, 28-19 and the Eagles closing the gap in the second quarter to enter halftime down by just three points, 47-44. UAV increased its lead by outscoring the Eagles in the third period, 26-17, and despite ERAU battling from behind to tie the game 80-80 with just 2:39 remaining in the fourth period, UAV would close the remainder of the contest on a 12-8 run to secure the 92-88 win and the top spot in the Cal Pac standings with two regular-season games left. Junior forward Tylen Price (Lancaster, CA) led all Pioneers with a career-high 32 points to go along with five rebounds and two assists, senior guard Samantha Earl (Covina, CA) tied her season high with 28 points and also added three rebounds and two assists, and senior guard LaChae McColor (Honolulu, HI) added 13 points, three boards and two assists. UAV hit 32-of-68 field goals (.471), 9-of-23 three-pointers (.391), 19-of-26 free throws (.731), and were outrebounded by the Eagles, 34-28. UAV committed eight turnovers and stole the ball nine times. ERAU made 28-of-65 shots (.431), 14-of-31 three-pointers (.452) and 18-of-25 free throws (.720) and committed 14 turnovers and stole the ball from UAV two times. Next game: Coached by Deon Price, the Pioneers hit the road to face UC Merced for a California Pacific Conference contest on Thursday, Feb. 14 at 5:30 p.m. PST in Merced, Calif.